I haven't been drawing many maps lately, at least not ones worth putting up anywhere at least. but I've been trying to think about how to use maps better. 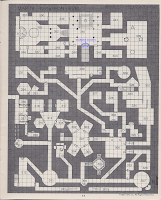 Maps are central to almost any tabletop role-playing game, and one of the few non-verbal elements of play. The issue is how to make maps useful, which means what levers one can use on a map to make certain kind of game. Below are the basic questions I've been asking myself about maps. The key here is making the map itself interesting? There are really a few basic kinds of maps I suspect – some sort of morphology that could be laid together like geomorphs (caves, temple, tower etc.) but that's not what I'm aiming at here. Here I’m comparing, a traditional free for all of rooms and corridors and more ‘realistic’ maps that have internal logic. Nothing wrong with a classic style map, but I tend toward a more organic map designed with a visable logic. To me it’s easier to write a place if the rooms are laid out sensibly with a use in mind. This is what I mean by fit. Does a room work with the rest of the map? Is the kitchen near the barracks? Is the armory? Is there a random room full of unhinged horrors between the guards and the food stores (because if so the guards aren’t eating much). This isn’t just a matter of taste and GM seeking ‘realism’ (which is more trouble than it’s worth) – it’s a way to allow the players a game of “what should be near here”. Like if the party wants to find the temple, finding some acolyte quarters, and meditation rooms should be a sign they are on the right track – the temple is not right after the rotgrub filled trash compactor (unless it’s a very special temple). Consider the maps below. 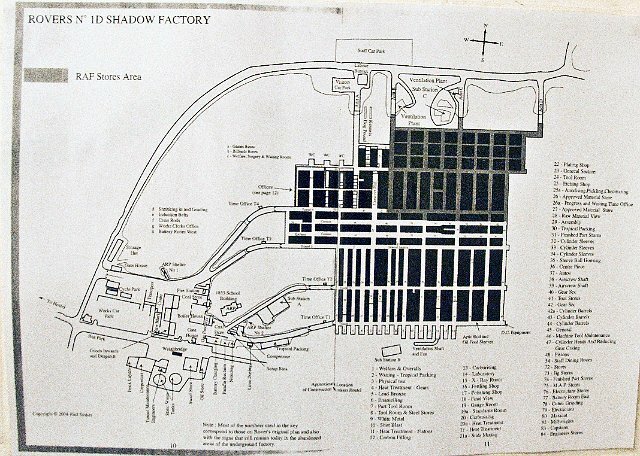 Both are good maps – the first is one of the levels of the Temple of Elemental Evil (map 1) the second some kind of buried factory in Drakelow England for WWII production. 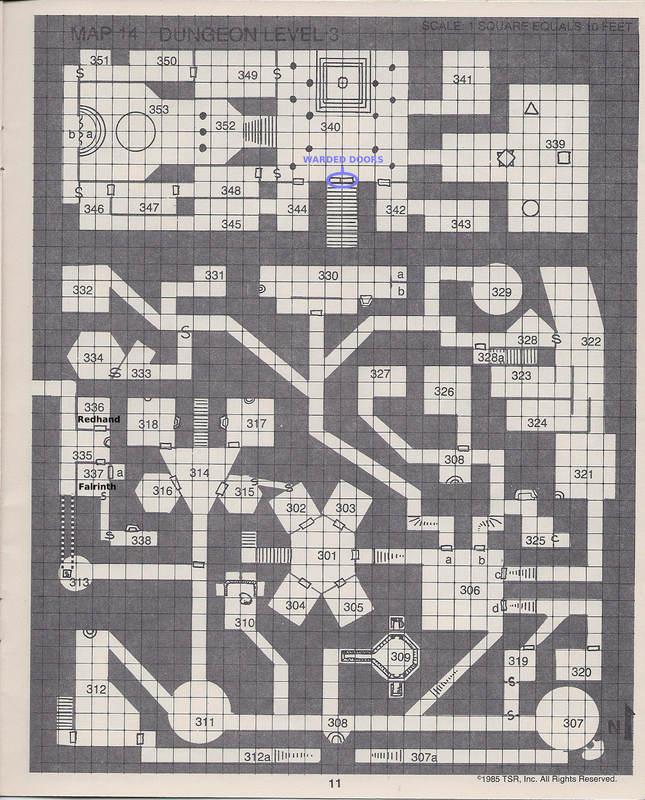 The dungeon map has bizarre shaped rooms, and weird corridors going off in odd directions. It’s designed as if it was drawn from above by someone trying to confuse a mapper. 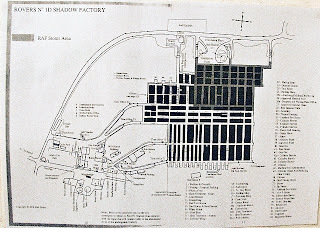 Yet, the map of Drakelow(map 2) is boring and repetitive, predictable because it’s room after room of barracks and factories designed with real world construction and ergonomic limitations. So the question isn’t “which kind of map to use” it’s “How far towards weird can I push my dungeon map and still retain internal logic”. Random Wizard*, a fellow who thinks a lot about systems and game history posted 10 questions. 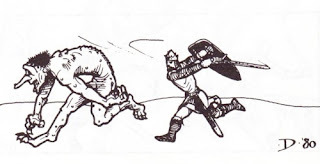 They are today's old D&D blog post of choice - so below are the answers for HMS Apollyon, and the questions in general. Generally I like race as class - it makes race a distinctive choice and emphasizes the rareness of and stagnant cultures of Demi-humans in the world. I don't use Elves Dwarves and Halflings on the Apollyon - rather Froglings (Halfingish MU/TH, Passengers (devil tainted MU/F), Flying Monkeys (F/TH), Merrowmen (Th or F or MU depending on stats). Ultimately there are also dwarf analogues as well on the vessel, but they haven't been 'unlocked' yet. Sure, well some passengers likely had their souls sold at birth by their power hungry families, but otherwise of course. Descending, but only out of habit. 10 I think - but I would like to impose a level limit of around 10 on everyone. Maybe 10 +1 per prime requisite bonus (Max 13). Well thief as written is kind of silly, but specialists are key I think - most adventurers aren't fighters or wizards. Most are some sort of skilled skulker and jack of all trades. I want my thief/specialist class to represent a huge variety of skills though: Safe crackers, Animal Handlers, Archers, Assassins, Hunters, Academics, Doctors, Con Artist Preachers, Skirmishers, and even Martial Artists. Yes, see above. It's hard to balance, but I like PC to feel different and have strange proficiencies as they level. I want to change from apoint buy system to something more organic, but haven't gotten it all written down yet. (7). Are magic-users more powerful than fighters (and, if yes, what level do they take the lead)? Depends on the player, depends on the Fighter, depends on the enemy. I don't worry about power much. No, everything talks common - even the undead. I love factions, and digging about on the sheet to see who speaks Sasquatch is boring. I like social interaction with monsters - even if they mostly shout "I'm gonna eat your eyes!". I use B/X via Labyrinth Lord mostly - quite fond of Little Brown Book D&D, and will convert Apollyon to that someday. It's not important though - I think the system matters, but only so far as it determines the feel of a game. Whatever system I'm using I have modded it a fair bit. PLAY REPORT! HMS APOLLYON - Higher Level Campaign Session 1. A party of seasoned adventurers decided to again brave the tangled gangways and vaults of the great vessel's stern. Following a map provided by Charlie Ogg's organization (the possibly revolutionary Krab Brother's mafia) the adventurers obtain passage through much of the Sigil Maze behind the fortress of the Marines (The HMS Apollyon's almost defunct order of quasi-religious knight-like protectors). The map suggests heading Northwest to find a hidden entrance to an ancient (an possibly unplundered arsenal), but the marine patrol will lead the adventurer's no further than an ancient riveted iron hatch. Beyond the hatch is a series of tombs. A crystal clear pool is tested with a coin, then almost poisons Mister Mister as he reaches after the coin, only to be purified by Quartle's water elemental companion. Beyond the pool are tombs - niches in the walls, sarcophagi both free standing and supine and even piles of bones. Almost all the male dead are clad in white ceramic armor, with patterns like a china plate, but seem unmoving and still. Other (female) mummies wear brown wrappings and long brown robes. Quartle deduces correctly that this is a Marine tomb complex - filled with honored and holy dead marines, and their female auxiliary, the Umber Brides (marine widows and orphans who are highly feared assassins). A trail of footprints in the still dust leads through a broken wall and into a smashed tomb, where ceramic armor lies shattered amongst dismembered and burnt mummified corpse bits. Port from the broken tomb is a hall of four doors. The Northern most door is picked easily by Ogg to reveal a tomb, where the sarcophagi begin to shift almost instantly open and a form made of hanging fire coalesces above the center tomb. Dead scavengers (likely from an aborted expedition by the still missing Rangvar the Crowbar) are scattered about. Fist banters with the fiery geist that materializes over the central carved alabaster tomb. 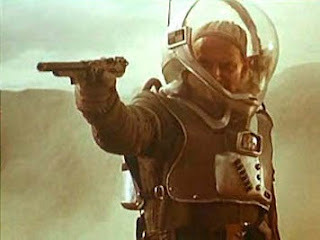 The creature appears to be a small withered corpse, suspended in the center of a suit of antique looking boiler mail - armor made completely from fire. 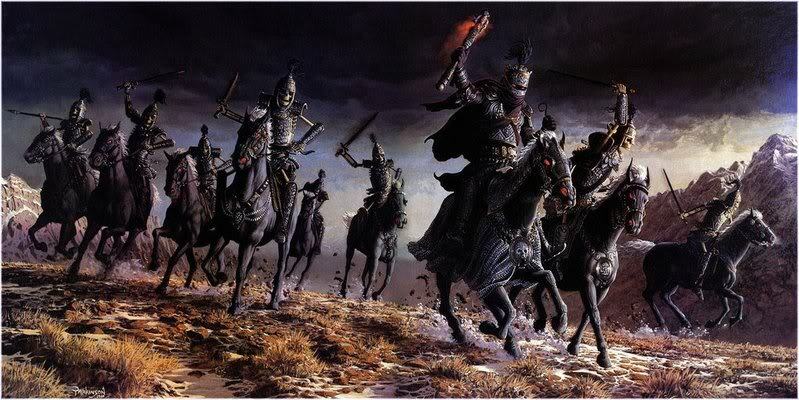 The dead refuse to let the party pass without battle, so the adventurers close the door and head South. To the south they find a chilled and misty tomb almost identical to that of the fire giest, and decide to avoid it. Beyond another Southern door (bronze and sculpted with a romantic scene) is a despoiled double tomb. A rubble filled hole in the Northwest corner shows where looters (or worse necromancers) dug into the tomb. Before it can be explored fully, Ogg is cursed by an ash covered skull levitating from the floor - apparently a farewell gift by the tomb robbers. The tomb is defaced with black graffiti (mostly necromantic symbols and circles) as well as candle stubs around the central tombs. The adventurers decide to dig out the hole, and soon find it magically sealed. Fist dispels the magic with the brutal power of Grok, orcish god of slaughter and battle rage, but digging through the rubble is a slow process. On guard, Semm spots a trio of spectral figures - women in brown robes that float amongst the hall and nearest tomb (the one filled with dismembered bodies) and begin to rearrange the corpses there. The spectres notice Semm and stare him down but continue to go about thier business until the priest retreats back to the party's diggings. The party has managed to dig almost through the blockage before the brown robed ghosts suddenly appear and one touches Quartle, possessing the wizard. Unsure how to fight the ghosts (protection from evil fails to stop them) the party keeps digging, and is startled again when Quartle looses a fireball directly at the floor. Luckily only Fist's hired torchbearer is killed. Before additional ghost related injury occurs Semm is able to use the power of Lyris to halt the ghosts and they agree to parley with the adventurers. After extracting a promise to bring the spirits the heart of "plague King - Serkat, the King Scorpian" within six month, the ghosts manage to pressure several magical items from the party in exchange for aid in negotiating passage by the fire geist. The geist agrees to let the adventurers pass (into the ancient fortress beyond) if they will name a champion to fight him for five rounds. Semm accepts and with divine protection and great aplomb manages to get the best of the geist in the short exchange of blows. 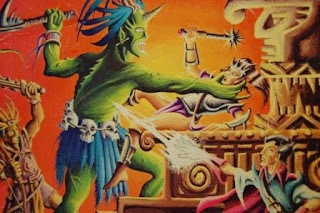 *I should add Random joined the 2nd Google+ game I played, a trip into some swampy catacombs with Joe the Lawyer's unkillable (though now orcish) triple classed AD&D elf thing "Sir the Fist". Random played an unfortunate henchmen that was sacrificed to ghoul no. 2 by Bobo the Monkey Zouve. He's also played in several Apollyon session and a game of ASE - most often as an understated warrior named "Red". Below Are Current Rumors for the HMS APOLLYON Year of the Fallen Star and the month of Brown Crabs. Within the oily smelling temple of the ship spirits, lit by the incense and candles at a hundred tiny altars, supplicants mill about under the wide glazed eyes of fanatical Ship Spirit Zealots. Upon asking for an audience with the local priestess, Lady Stott, the adventurers are told that she is currently on the street of temples, pleading a case in the Central Shrine there. 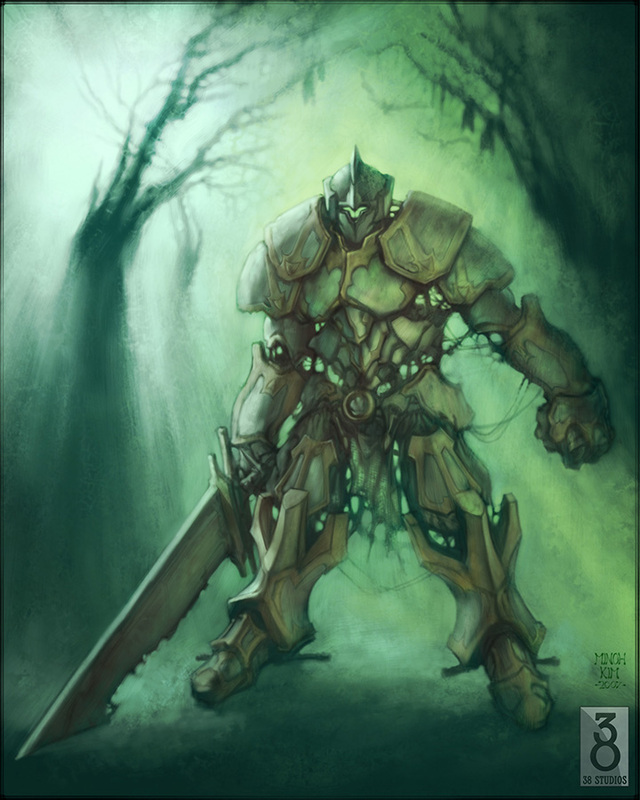 Her crusade commander and factotum Brazen Gear will meet the party gladly and discuss the needs of the Spirits. Gear is no longer the frightened drudge he was when the party healed him from the edge of death after a Merrowman ambush. In the past year he has been filled with power by the Ship Spirits, and now overflows with their favor. Still a smallish man, his scarred head seems tiny compared to both an extravagant beard and the heavy enameled bronze plate armor he habitually wears. Gear is glad to see the party, especially as some of their efforts allowed his forces to break the siege of the so called ‘New Lands’ where the temple now rises in what was formerly a bloodstained chapel to the Cult of the Ravenous’ cannibal god. 1) Gear can offer the following leads on the undead menace beyond the buried vault. The gate at the end of the vault cannot be forced, the Ship Spirit lay brothers and zealots have barricaded this side, as efforts to pass were met by revenants in decaying steam armor that slaughtered droves of soldiers with necromantic weapons before being driven back by the combined powers of Stott, Gear and a Brother Beedle (along with a circle of his fellow Priests of the Eternal Queen). There may be a way around into the haunted village beyond, a central vault with quaint freestanding buildings and faux – wattle and daub cabin towers. Likely the best bet is to go Port through the supply areas, but this is only Gear’s guess, perhaps going down or up and forward would work better? 2) He’s still interested in acquiring as many crew served weapons as possible – and will pay good money for them. Gear and Stott even have authorization to trade ship relics for battle ready weapons. Emerging into the blue arctic light Beni Profane, Lama Karna, Pron the Giant Child, and Eariyara the Sorceress beam with relief and scuttle down the wind warped mountain towards the ancient petrified logging town where they've made their camp deep in the Cobramurk mountains. Below them broods an ancient temple to the necromancer queen Orcus, where the petrified screams of untold sacrificial victims hang in the air. The ominous nature of the tomb and the obvious barely constrained power of the place convinced the party that further blind exploration was inadvisable, and the adventurers resolved to head to Trollmun, the citadel of the Necromancer Efulziton the Unseen and his sorcerous court. Back in 1979 so folks wrote a nasty nasty tournament module titled Hidden Shrine of Tamoachan, for the 1979 Origins Game Expo. Apparently it got played and was later released (1981) as one of the more famous early modules. Hidden Shrine is sometimes held up as a great module, and maybe it is, but frankly I wouldn't want to run it an I wouldn't want to play it. There's some lovely stuff in it, and it has a great deal more "feel" and "nuance" then other early modules - but it's an obvious Gygax/early TSR thing (with his normal vices) and a terrible railroad. I've read it so you don't have to. I'm not saying this is a bad product and frankly were I a more ambitious/unemployed man I might write up a new version of it as a homage. Because of this I want to talk distinctly about what's good first, and then bullet point the bad and the ugly as well - because there is a fair bit of both. The characters find a nominally Meso-Amercian shrine/tomb to plunder, or they fall into one and must escape. It's a real puzzle dungeon, full of traps and set piece rooms. As such it's good a lot of transportable content and the traps are not even the bad Gygax style, like in Castle Zagyg (The wizard did it - you can't escape!) but rather really reasonable and environmental. Still the traps do have a Gygaxian level of deadly attached to them though. Let's talk about monsters a bit, and more specifically about monster manuals. Wizards of the Coast has been discussing monsters lately for 5e, but I have my own take on these things - perhaps a retrograde lout of a take, but one of my own all the same. Monster manuals are great - the AD&D Monster Manual with the Art Brut cover, as $5.00 on sale copy from Kay Bee Toys was my first book purchase for myself. It provided many hours of joy. Likewise the Teratic Tome I recently acquired is a fun read. That said I don't really use much in the way of monsters from books these days, tending instead to make up gruesome things on the fly and wholesale swiping the stats of a few select creatures from the Labyrinth Lord book (such as the bear!) to reskin, and adding special abilities vaguely remembered those long ago summer nights perusing the Monster Manual. What this means is that I like monster manuals, but don't really have much use for them. I don't think I'm alone in this, and it's not as if I don't find bits and piece of monster design from other people's work inspiring. I really do, but I steal it and pile it onto my own monsters. How then to make a monster manual more useful for me? Below are three versions of a monster with explanatory texts - representing three varieties of the ubiquitous goblin. 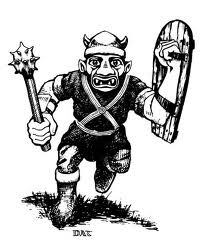 The goblin has been chosen because it's a sort of Ur humanoid, representing a creature that can mob a party, and perhaps battle 0-level men at arms one on one. The goblin also possesses an enormous variety of incarnations - something that helps illustrate my boredom with traditional monster manuals. 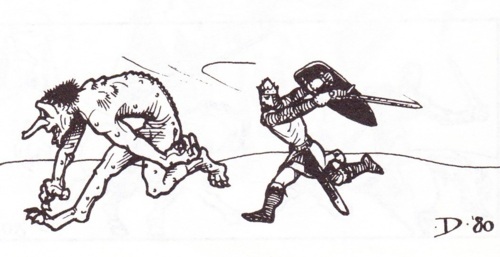 The most basic traditional Monster manuals contain a stat-line for a specifically named species of monster followed by a set of mechanical notes. The goblin is as follows, and I've used the version from the Little Brown Books - mostly because it's short and right here. "These small monsters are described in CHAINMAIL. They see well in darkness or dim light, but when subjected to full daylight they subtract -1 from their attack and morale dice. They attack dwarves on sight. Their hit dice must always equal at least one pip." The Certopsian Plains, where the shadows of the distant clouds creep long like black burn scars amongst the dry hills, silver sage brush, waist high savannah grasses and dust bedeviled alkali flats. This clean, hot vastness obscures thousands of years of tragedy and evil, marked only by grit scoured bones and the tumbled petrified timbers of ancient homesteads. 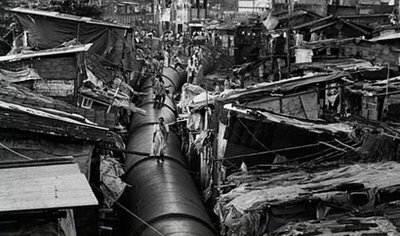 Sometimes these tragedies leak back into the present, manifesting in the form of Ghost Towns, each a unique colony of supernatural necromantic power. 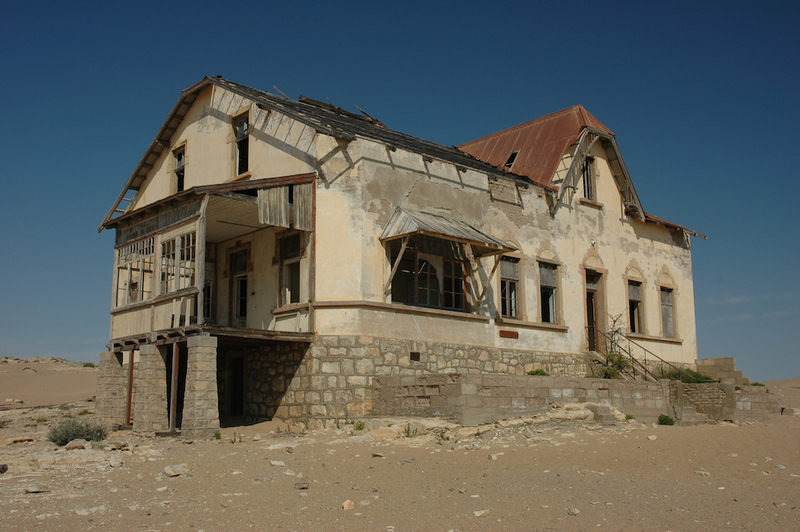 Ghost towns are dreams of the past, and will loom from the shadows of dusk, suddenly revealed in a gulch or behind the next ridge ready to succor weary travelers. The towns often appear plausible and are not always hostile, but they are inherently dangerous and unnatural. Ghost Towns are incredibly dangerous, even to powerful adventurers or large organized group, as a fully hostile and active Ghost Town may attack with tens of weapon immune, life draining phantasms from all directions. Towns may be defeated and destroyed, but it is usually advisable to simply flee as the phantasms will only pursue intruders a few hundred feet into the night. So I stumble along working on Tomb of the Rocketmen. I figured I'd post some of it as a goodwill gesture. Below is a table of random "Notable Rocketmen Sarcophagus Pods" There's only a 10% or so of finding one of these (and a 5% chance of finding a special encounter) amongst the 300 odd pods, put I like rewarding diligence and providing strange tables.